Car insurance premiums in the UK have hit a record high, partly because cars’ increasingly complex electronics have made repairs more expensive. The average annual comprehensive policy cost £462 in the last three months of 2016, according to the Association of British Insurers (ABI). Previously the highest figure was £443 in the spring of 2012. The rise comes in spite of government attempts to limit compensation payments and cut court costs. One reason for the increase is a rise in the cost of repairing cars that have been in accidents, because of their increasingly sophisticated electronics. Buying in spare parts is also getting more expensive, due to the weakness of sterling. The average repair bill has risen by 32% over the last three years to £1,678, the ABI said. The ABI warned that premiums were likely to increase further, if the government went ahead with plans to review the so-called discount rate. When accident victims are given a lump sum in compensation, the sum is discounted to make up for the extra investment return they are likely to receive. Since 2001 the discount rate has been 2.5% – based on investment returns from government bonds. If that rate is reduced, insurance companies will have to pay out more – thus increasing premiums. “The sudden decision to review the discount rate has the potential to turn a drama into a crisis, with a significant cut throwing fuel on the fire in terms of premiums,” said Rob Cummings, the ABI’s head of motor and liability. 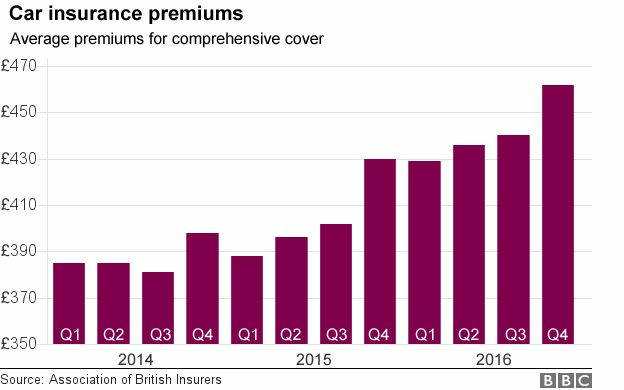 The cost of insurance has also risen because of a series of increases to Insurance Premium Tax (IPT). IPT went up from 6% to 9.5% in 2015, to 10% in 2016, and will rise to 12% in June 2017. Personal injury claims, such as whiplash, have also become more expensive, rising by 2.3% over the last year, the ABI said. However, the government is currently consulting on plans to cap compensation payments to accident victims, which it says could reduce annual premiums by £40 a year. It also wants more disputes settled in the small claims courts, which would reduce costs for insurance companies.